How are walnuts good for us? There is, admittedly, something a little uncomfortable about a phrase like "cell death." Cells are what we're made of; death is bad; etc. So given certain facts, Maja, yours is a reasonable question: Walnut trees, along with other members of the Juglandaceae family (pecan, hickory), do produce a compound called juglone. And the 2005 study you linked to in your email, from the journal Toxicology and Applied Pharmacology, did indeed find that juglone induced death in the human cells researchers applied it to. The authors concluded their report with the suggestion that "since juglone is present in human health and beauty products, a further understanding of its effects on human cells is warranted." They weren't the first to wonder about juglone's potential effects on human well-being. Scientists before and since have explored that very question—but mainly what they're looking at is whether a little juglone might actually be a good thing. First, though, let's back up. The various nonalimentary benefits of juglone, medicinal and otherwise, have been well-known for ages. 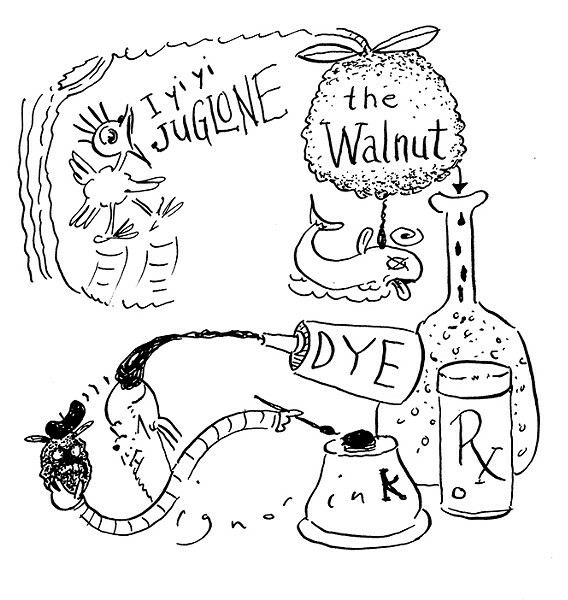 (And it's nonfood uses I'm talking about exclusively here: juglone, found in the walnut tree's roots, bark, leaves, wood, and green nut-hulls, is unrelated to allergies triggered by eating the nuts themselves.) In the early 20th century, for instance, American doctors prescribed juglone to treat various skin conditions; it's been used as a folk remedy around the world to battle inflammation, fungus, intestinal issues—you name it. In addition to enumerating its long career as a natural medicine (as well as an ingredient in hair dye), a 2012 literature review suggests we haven't yet tapped juglone's full potential, including as an herbicide and biocide—the authors propose using it to rid ships' ballast water of invasive marine species. These properties, too, are already folk knowledge. Lazy fishermen used to dump unripe walnut hulls into ponds to take advantage of juglone's toxic effects; the stunned fish would float to the surface, easily collectible. And as an herbicide, juglone will be familiar to backyard gardeners as the reason you don't want to grow some vegetables too close to a black walnut tree, the richest source of juglone in the Juglandaceae family: it inhibits the respiration of certain plants (including tomatoes, potatoes, peppers, and eggplant) living within the walnut's root zone, which in a mature tree can extend up to 80 feet. So far, so good: this is potent stuff, and humans have figured out some crafty ways to deploy it that, often as not, exploit its unique lethality. But inside the body? That 2005 paper you cite found two responses juglone produced in human cells: necrotic and apoptotic. Necrotic's no good. That's the capital-D death you're worried about but scientists evidently aren't—I wasn't able to find much more research into juglone's necrotic tendencies. They're far more interested in getting juglone to induce apoptosis, which is the naturally occurring process, also known as "programmed cell death," by which our bodies cycle out cells that are no longer wanted, or that present a threat to our health. Scientists' thinking is this: Can juglone be used to produce an apoptotic response in something really nasty inside of us—say, cancer? The research has been promising. A 2009 study in Cell Biology International reported on exposing, in vitro, a chemotherapy-resistant line of melanoma cells to juglone; the juglone did enough of a number on the cells and their tendency to proliferate that the scientists suggested the compound might be characterized as an anticancer agent according to criteria put forth by the National Cancer Institute. Similar reactions have been observed when juglone has been let loose on leukemia, prostate cancer and cervical carcinoma. And we haven't exhausted juglone's medical possibilities even where cancer's not concerned. One recent study found that its antimicrobial properties prove effective against Acanthamoeba, a common protozoan that can cause granulomatous amebic encephalitis, a rare but highly unpleasant infection of the brain and spinal cord that affects people with compromised immune systems; researchers floated the idea of using juglone as a disinfectant in hospitals. It's shown potential as an antiviral agent, too, as when it was recently pitted to salutary effect against the protein 1a8g, an enzyme in HIV. I'll allow as to there being one distinct danger associated with a full-grown black walnut tree, as evidenced by the long-running saga of several Toronto residents trying to get permission to remove such a tree from their neighborhood. It seems the walnuts fall so hard and heavy that somebody getting seriously beaned is, to hear the locals tell it, practically inevitable. When in 2007 the city council considered their most recent anti-tree petition, one witness cited her 87-year-old mother as a potential victim: "A good whack from one of those fruits is probably going to see the end of her." "Walnuts do fall," Toronto's parks chief admitted, "and they could cause a little bruise." But the council still blocked the tree's removal, deeming the hazards it posed to be, apparently, quite negligible.